Close Grain: "Dad, I want to build a box." 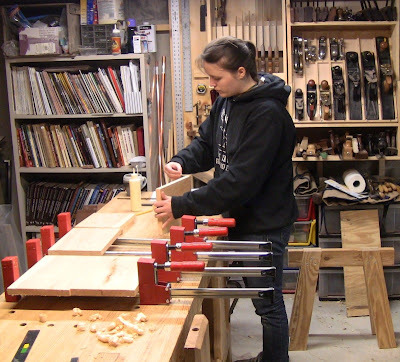 "And I want to use dovetails." Brings a tear to my eye! What more proud moment for a father? 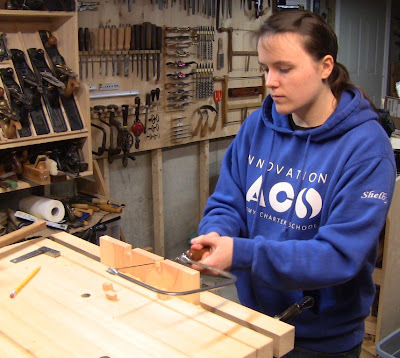 My daughter Shelby, a senior in high school, wanted to build a box to collect submissions for the school literary magazine. 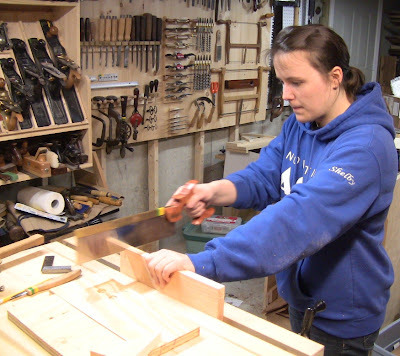 She had wanted to build the school box from The Joiner and Cabinetmaker over a year ago, but I kept putting her off, busy with other projects. In this way our children's lives flash by under our noses. Cue the Harry Chapin. 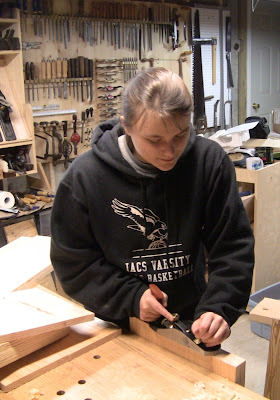 At least last year I was able to help out with her boat-building project at school. My son, in contrast, after finishing his Boy Scout Eagle project building picnic tables for the town park, swore he would never pick up a tool again. I think having to supervise a half-dozen other teenaged Scouts put him over the edge. This time I was determined to get it done. In the workshop, I pulled out some pine 1x8 and we discussed how to cut around the knots and defects. She picked one bit of interesting knotty grain that she said looked like a galaxy for the front. The design is a cross between the school box and a mailbox, the grain running across to dovetailed sides, with a sloped top. We needed to glue up wider panels to be tall enough to hold 8 1/2x11 paper dropped in through a slot in the top. This was the first time Shelby had really used any of these tools, so for each operation I showed her how and then let her do it. Some of the handles were a little big for her hand, but she did very well handling them. 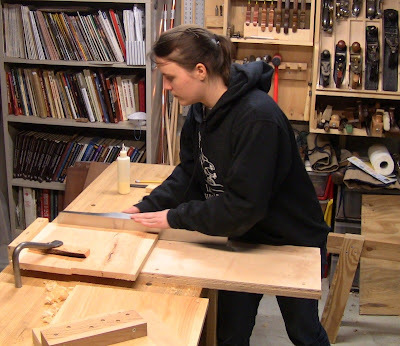 Crosscutting the pieces from the board. Cleaning up the edge with a Lie-Nielsen #4. That's easier to handle than a full-size jointer. Glue-up to make wider panels. We watched TV for a couple hours while the glue dried (our favorite father-daughter shows are Criminal Minds, The Walking Dead, and Justified, good wholesome bloody fare; she says Timothy Oliphant is hot). Then she scraped the glue lines and dimensioned the panels. Shooting the front panel end grain with a Lie-Nielsen #7. 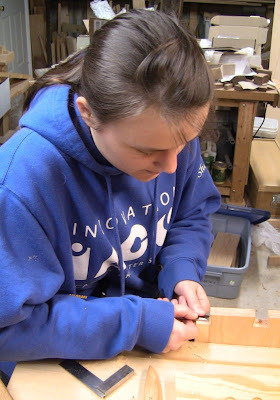 Planing the end grain of the two side pieces ganged together with a Veritas small bevel-up smoother. Cutting the sloping top of the side after knifing a line and chiseling a trough to guide the saw. Ripping the front panel to match the height of the side. Jointing the ripped edge with a Stanley #6. 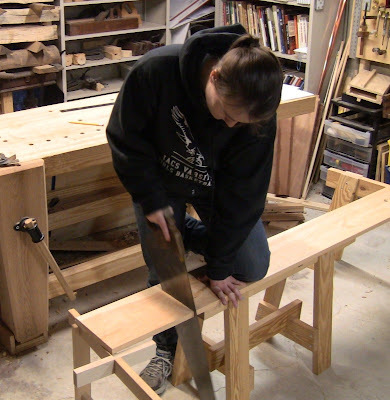 Next I had Shelby do some dovetailing practice. 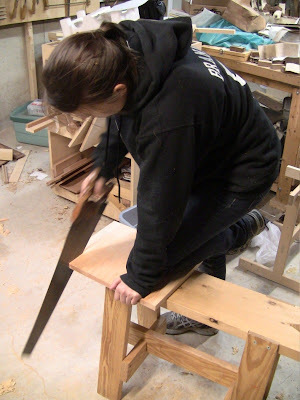 First is sawing practice on a piece of scrap. 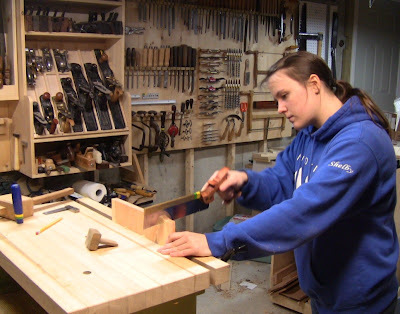 She's never handled a joinery saw before, so this teaches her how to control it. 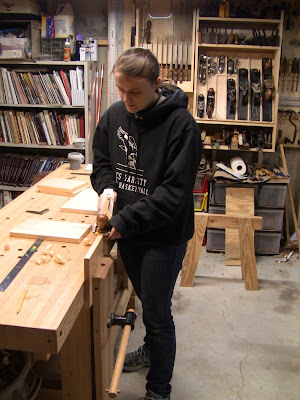 I'll be showing her Paul Sellers' method for dovetailing. But first I took some of his advice and modified my dovetail saw, filing the first inch of teeth back to remove the rake, turning them into little equilateral triangles. 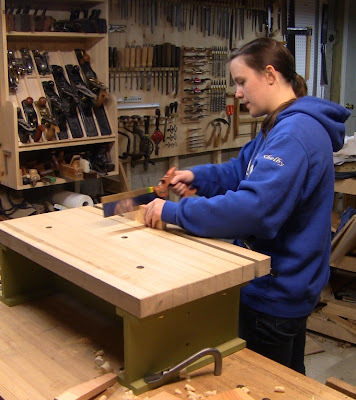 This means they form a trailing edge to the end grain, so the cut starts much more easily. Making a set of repeated cuts to develop the required control. Then I started a pair of tails in some narrow scrap for her to complete and transfer to the pin board. I didn't bother measuring anything, I just wanted her to see the different steps involved. Sawing out the waste between the tails. ...and chiseling out the final bit of waste. She made the pin board and we put the joint together, examining how it fit. Now it was time for the real thing. I showed her how to lay them out, keeping it down to three tails to keep the number of mating surfaces down, since each one is a place where things can go wrong. 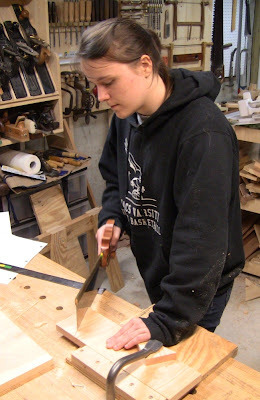 Like anyone doing their first dovetail joint on a real piece, she worked slowly and carefully. This takes an enormous amount of concentration. The guys you see online banging these out in a couple minutes? They've done a few before to get to that point. The pressure's on! Sawing the tails. ...and chiseling out. She did this from both sides, meeting in the middle. After chiseling troughs all around, making a Robert Wearing/Chris Schwarz first-class cut to remove the end pin waste. Final paring using Phil Lowe's chisel corner method to clean out the end pin space with fine precision and control. The resulting tail board, which will be the front of the box. I told Shelby she had some nice looking tails there. She said that was inappropriate. Next, we'll finish off the tails on the other side of the front, then do the pins on the sides. This is quality time beyond compare. Looks like a great project & a wonderfully enthusiastic & talented daughter. Fantastic - made me smile. Hope she sticks with this hobby. Good for you Dad. I have some good memories of working in the shop with my kids. Good to see your making some memories with your daughter. That's excellent Steve! Great she was motivated to do the work. And don't be too worried about your son. 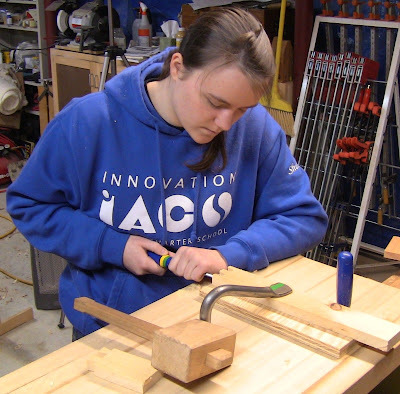 I think the most challenging part of an Eagle project is the management of the work force. I'm sure he'll pick up a tool again... someday ;-). Thanks everybody! She really does have an aptitude for it, and it's great fun. 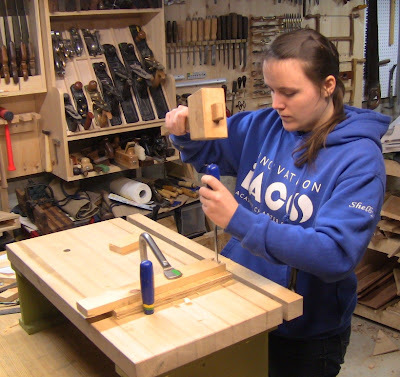 Jim, indeed, the primary purpose of an Eagle project is not the end product, but the actual experience. There are some awesome projects out there, but also many humble ones which nevertheless give a boy a chance to go through planning and execution stages, and practice direct leadership of others. Those are important skills to develop, because life often thrusts leadership upon us at unexpected moments, like the Night Clerk in battle. 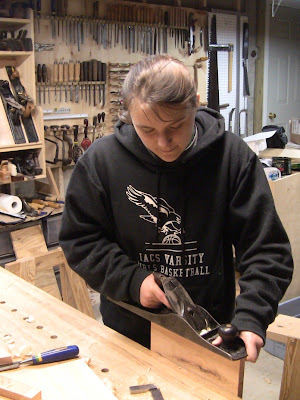 While the Eagle project is only a taste, the goal is to prepare boys for those times. Absolutely Steve. Let me also say Congratulations to your son for his Eagle! Shelby has the appearance of someone who knows what they are doing. Look out world the women have arrived at last! Man! I'm jealous! As the father of two daughters (the elder is only 6) I sure hope one of them takes an interest. I hope you continue this series. I'll be living vicariously through you! Wow! I agree that Shelby certainly has the appearance of someone who knows their way around a workshop. 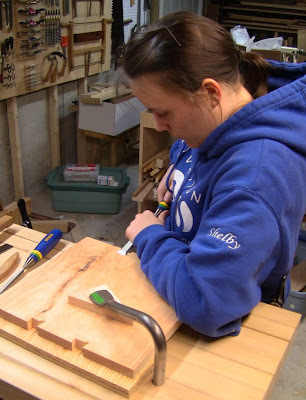 I own my own carpentry firm and I'd love it if one day my children would also be interested in carpentry and joinery. You must be really proud of both of them! Thanks! Yes, I am indeed proud of both of them! That was a beautiful tail board she has cut. I am just picking up the hobby. I could not cut tails like that yet. Thank you for showing best regards from Australia. 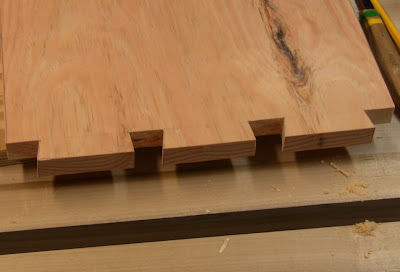 Those are some lovely dovetails. What is a 'Robert Wearing/Chris Schwarz first-class cut' and come to that, how do I use 'Phil Lowe's chisel corner method'? I've got a mid-tewrm exam coming up and I'm sure dovetails will be involved, so any ideas are welcome. Robert Wearing is the author of "The Essential Woodworker", an excellent book and one of Chris Schwarz's influences. In it he describes the three classes of cuts: third, where it doesn't have to be accurate or look good (cutting a board in half); second, where it must be accurate but doesn't have to look good (will be buried in a joint, or hidden on the inside/back of the project); and first, where it must be accurate and look good (a highly visible cut on the exterior of a joint, any gap will look bad). For first-class results, mark a line with a knife, then remove a small trough from the waste side with a knife or chisel. Paul Sellers calls it a knife wall. The saw will then register in this trough, so you know the cut is accurately placed and is clean at the surface. Schwarz has written about the method frequently. 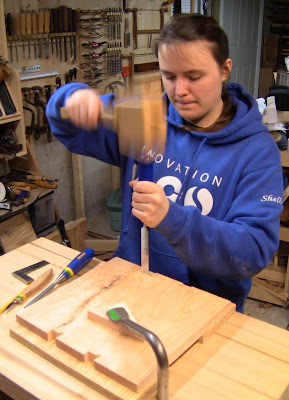 Phil Lowe has mentioned this in several of his Fine Woodworking articles, particularly his "4 Chisel Tricks" from #221. 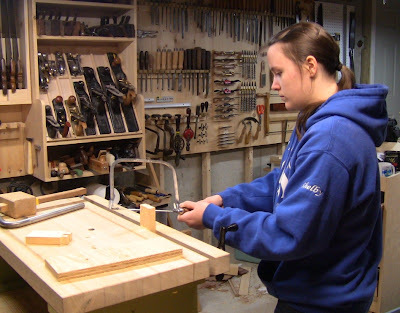 When cutting tenons or dovetails, after sawing off the bulk of the waste to within 1/16" of a knifed line, he uses just the corner of the chisel to pare the end grain in a series of progressive cuts made into the line. This concentrates the force of the tool onto a small cutting point, removing a small amount of wood very accurately. Each cut steps over to the side another 1/8", so only the corner cuts in while the rest of the chisel edge registers against the portion already trimmed. Each cut is guided by the previous one. He chokes up tight on the chisel end for control. Note that both of these methods involve knifing a line accurately, then using that line to register the cutting edge of tool precisely.